The first level of the game is set up to introduce the player to what kind of world they are about to step into when beginning the game. It’s intended to get the player used to all the elements of a new game, much like a tutorial level, thus explains the storyline, and gives the player an example of combat, and shows the RPG element. Since it is the first level of an RPG styled game, the combat you experience and enemies faced will not be overly difficult. The first level begins outdoors in a winding valley and progresses to a camp for one of the larger Warbands in game. Large rock canyons and a nomadic camp dominate the level. The canyons twist and turn, with crevasses and caves set in a desert wasteland. The level finishes with a dark cave that the player must enter to progress. Enemies in the level are monstrous in appearance. Trolls, and goblins and an array of creatures with distinct subterranean appearances will appear throughout the level. They will not be too strong until the end boss, to avoid creating too difficult and experience for the player. The player starts in the back of a troop transport heading towards the Warband outpost in this region of the wasteland. He or she must watch out for enemies that are trying to attack the vehicle and prevent them getting to their destination. The player uses a mounted machinegun on the rear of the tuck. This is to get the player used to using the games style of aiming. On beginning the level the player is manning the gun in the troop transport, hearing a sergeant in the truck explain their situation. As the truck drives towards its destination the player will see enemies that they must dispatch to keep the transport safe to arrive at the camp. Enemies will come from the air and the canyon walls and ledges coming down upon the transport. After progressing along the winding canyon and fighting off the attackers, the player arrives to the relative safety of the Warband Camp. After leaving the canyon and entering the camp, the player views the tents and cheap structures that make up a basic encampment. Warband NPCs are moving around doing their jobs; new recruits are being trained, ready to help advance the Warband’s cause. After a tutorial at the firing range the camp falls under attack. Upon entering the camp and disembarking from the truck the player is able to move around and explore before an instructor comes across them and takes them to the training area. Here the player will be taken through the principles of firing, movement, the RPG element of the game (the player must purchase the regeneration skills as part of the tutorial) and given more information about the status of the Warband. 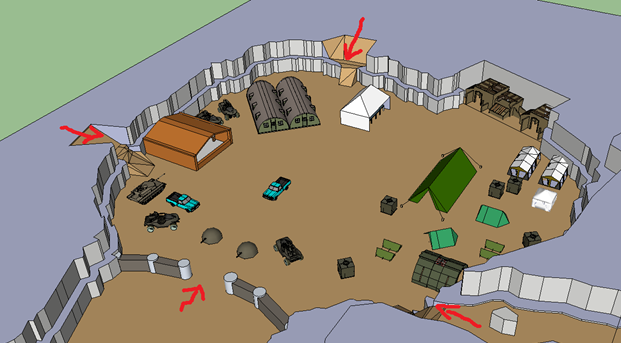 Once finishing the training, the camp falls under attack from multiple directions as waves of enemies attempt to break past the defences and barricades and assault the interior of the camp. The player must move about helping fight off each assault from different locations using the tactical elements of cover that the base provides and working with the other defenders to maximize the effectiveness of the defence. 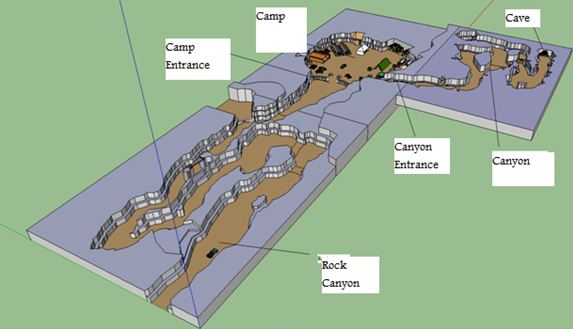 The monsters will assault from the tops of the canyon coming down into the base, as well as from the main entrance. The most focused assault will come from the path to the right of the entrance. The attackers will comprise of weaker creatures as well as stronger ones that will require multiple defenders to bring down. The player will have the opportunity to experiment with new weapons in this portion of the level, continuing on the training experience, as well as getting a chance to use the RPG element to develop and advance their character. Once the assault is beaten off, the commander calls the player in for a meeting, demanding that the camp go find the source of this attack and put an end to it to ensure safety. In this section the player may take with them a small buggy with a simple machinegun mount on the back, NPCs or other players can get on (the buggy doesn’t have much health it will most likely blow up early on, this is just to familiarize the player with vehicles). After leaving the camp the player progresses up the path to the right of the entrance to pursue the origin of the attackers. Following the winding path the player comes under frequent attack before arriving at a cave entrance. The player must advance through the canyon slowly progressing toward the origin of the attack. The skills of the player are tested here as attacks come from seemingly random places on the canyon walls and from the canyon floor, requiring quick responses to them as well as careful placement of shots so as not to run out of ammunition too early on and have to struggle towards the very end of the level. If the player takes the wrong route, he or she will wander into a dead end. This is also a trap, and enemies will constantly spawn at quite a fast rate until either the player retreats or thirty have been killed. (Red lines represent attack avenues and blue represents player progression, yellow circles are choke points). As the player leaves the safety of the camp and progressives farther into the canyon attacks become more frequent and vicious. The tracks down from the canyon roof become more common, so there is less rest time between attacks, less time to prepare, and ultimately more than one avenue for enemies to come at you from once. The player will be required to advance carefully along the whole length of it, moving from cover to cover to prevent the chance of being surprised and assaulted out in the open. After fighting through the attacks and moving on through the canyon the player will see a cave in the distance, and go through one final two way assault upon their party before being free to approach it. As they enter the cave, a cutscene begins, showing monsters, and cages in a dark, eerie environment, prompting the player to accept it will be a tough fight to navigate their way through this area and find out what the source of the attack was. No gameplay, this is just a cutscene ending the first level of the game.